The book looks at the history of the Spanish horse, his breeding, conformation and temperament, and his traditional training for the bull ring, la doma vaquera, la garrocha and la doma classica: the true art of classical dressage. 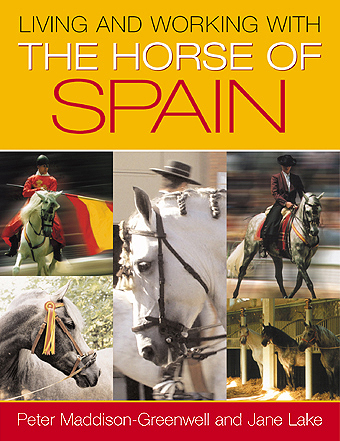 The authors cover the Spanish method of training of the horse in-hand and under saddle as well as the training of the rider, and there are chapters on the Spanish horse in the show ring, saddlery, costume and traditional turn-out and presentation. Advice is given on buying Spanish horses, their care and management, and whether or not to breed. Both practical and poetic, this celebration of the Horse of Spain is distinguished by a wonderful selection of photographs. Images of beautiful Spanish horses performing high school movements and airs above the ground, carrying costumed Spaniards at the Feria or evading the horns of black fighting bulls with courage and agility have entranced horse lovers for centuries. Increasingly riders are buying or importing Spanish horses and the authors have prepared this book for those who aspire to share their lives with the Horse of Spain. PETER MADDISON-GREENWELL has always kept and trained horses, including polo ponies on the Rothschild estate. As his reputation as a trainer grew he gave up his advertising career and is now recognised as one of world’s top trainers in his field. An interest and affinity with the Spanish horse led to his involvement with the British Association for the Pure-Bred Spanish Horse. Peter and his partner, Daniella, travel with the First Equestrian Theatre and El Caballa de Espana, delighting audiences with moving and exciting displays and demonstrating the consummate skills of the rejoneador and la garrocha. JANE LAKE taught Western riding at a stable in Almeria in southern Spain in the 1980s. She worked with Spanish, Hispano Arabe and mixed-blood horses, and lived and rode in the spectacular landscape of Andalucia. Returning to England, Jane joined J.A. Allen, becoming in-house editor for twelve years before going freelance, a move which enabled her to devote more time to her association with a Western stunt team, learning tricks and becoming part of the display. She now acts as commentator for the team. Hardcover Book, 11 in. x x 8.5 in.